Want to check out SN ELITE? Try our FREE camps in July! What a season it has been for this team. These boys have come so far in the last couple of years and truly symbolize what it means to be a team and play for each other. As our oldest team, they do a superb job at carrying themselves the right way and being role models for the younger Bears teams. Congrats on another championship gentlemen! These boys have been through so much and we are so proud of this team and how far they’ve come! Congratulations players and coaches! 10U Bears take down the Silver division in Woodland in their first tourney of the year! Our 11U goes 3-1 in their first tourney of the 2017 and brings home a Silver division championship! The boys did it again! 13U takes down another title at TPR Modesto. After going 1-1 in pool play they were awarded the #4 seed. After winning their first game against the #5 seed on Sunday, they then took down the #1 and #2 seeds en route to another championship. We're very proud of these boys for not only their accomplishments, but the effort they put forth each and every day. Congrats gentlemen! A 3-1 weekend gives the 13U their second title of the season. After going 1-1 in pool play, the boys won both games on Sunday by the way of walk offs in the bottom of the 7th. This team plays for each other extremely well and they never give up even when down late. This was shown again in the championship game when they were down 4 runs twice and persevered to win on a walk off basehit. This was their fourth walk off win this season. Congratulations boys! Our 11U came up just short this weekend as they took second place in the gold division in Sparks, NV. After going 2-0 in pool play they were awarded the #1 seed. In the semifinal game they won in dominate fashion to put them into the championship game. After battling for a full 6 innings, they came up just short but competed until the end. This is this team's second second place finish in the gold division and we know that hardware is coming real soon!! Great job players and coaches and thank you parents for sticking it out through the tough weather! After going 2-0 in pool play, the 11U Bears were awarded the #1 seeded going into single elimination Sunday. In the semifinal game, they won a tight 2-1 ballgame to get into the Gold division championship. The Bears took an early lead but were unable to hold on as they would fall to a quality ballclub. This team has a lot of great baseball ahead of them as they continue to learn and grow together. A moment of silence was taken before this game to remember those who lost their lives on September 11th, 2001. After going 1-1-1 in pool play at the River City Labor Day tournament, Gold Country had another tough Sunday ahead of them with three wins needed to bring home the hardware. With this team having done that twice before, there was no doubt that they could get it done. Three hard fought games later, they have brought another championship home to GCBA! 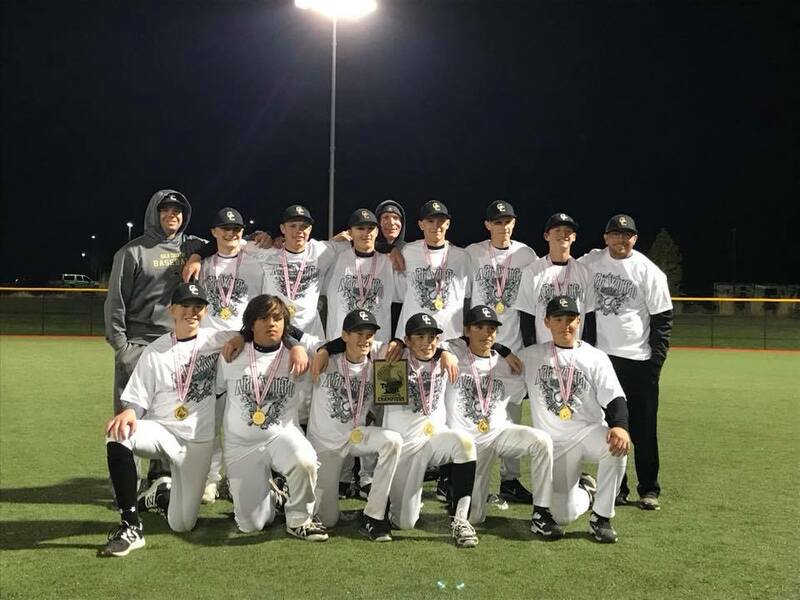 After being placed into the Silver Bracket at the All World World Series, the 16U Bears really caught fire and rattled three straight wins off in the single elimination bracket to take home the Silver Division title. We are excited to see what these boys have in store for next year! After losing their first game the 18U rattled off four straight wins including 3 on Sunday in 100+ degree temperatures to capture the title in their first tournament of the summer season. It turned out to be an all around team effort as it took all hands on deck to be able to pull out the victory.